I teach, among other things, 10th grade English and part of our curriculum is a career unit – a 3-4 week exploration of the work world and the skills needed to be successful there. Practically, this means that students pretend to interview each other (Why should I hire you? ), job shadow their moms at the Century 21 office, try to imagine what life would be like as an adult, and whether they should run screaming to the hills and live off moss and grubs in the Olympic National Forest. One difficult aspect of teaching the career unit is finding materials that both give useful and accurate information as well as strike the right tone of honest advice without being unbearably condescending. Many of the articles and career books currently on the market tend to boil down to telling kids “Don’t be such a kid with your Halo and your Brittney Spears! You’ll be in the work world soon and the Chinese are gonna eat your lunch if you don’t learn differential calculus and theoretical physics.” I am constantly looking for something that students can relate to. Of course, it also has to be an honest appraisal of what you need to be successful. 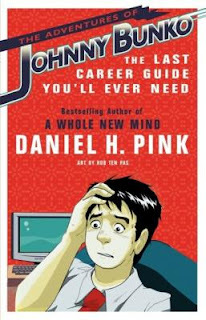 Daniel Pink’s THE ADVENTURES OF JOHNNY BUNKO is a radical and fascinating attempt at career advice. Eschewing WHO MOVED MY CHEESE pablum, Pink couches his guide in a manga comic book that tells the story of Johnny Bunko: a blander than bland salaryman stuck in a dead-end job at Boggs Corporation. Through a series of implausible (but very manga-rific) events, Bunko comes into possession of magic chopsticks that summon a magic sprite who leads him through the six most important career laws. These laws range from 1) There is no plan to 6) Leave an Imprint and Diana, the manga sprite, illustrates each one by whisking Bunko and his friends away to various places so he can experience her wisdom firsthand. Reading Bunko, there is a certain level of shock that a career guide could be this much fun and contain pictures! For anyone used to the genre epitomized by THE SEVEN HABITS OF SUCCESSFUL PEOPLE and similar tomes, it takes some getting used to. Also, Pink is known for books like A WHOLE NEW MIND that argue that right-brained, out of the box thinking is the most crucial skill set necessary for the 21st century. You might not agree. Maybe kids do need to learn differential calculus. Still, if you put that together, you get a unique, entertaining career manual that is especially appealing to high school students. I do have to say that the advice tends to be very general and exhortatory and for some that might be too vague. Also, some of the language (“bullcrap” and “numbnuts”) is juvenile. However, some of the advice can easily apply to a student’s academic career and is a handy way to begin discussion on how students see their place in the world of work. Rob Ten Pas’ manga-flavored artwork should be especially accessible to students — or at least that group of students who still hold fiercely to their Pokemon or Dragon Ball Z days. It’s a good mix of the realistic with the fantastic and chock full of girls with big eyes and swooping action panels. There may be issues with the fact that students might associate the style with the younger/less serious middle school years and thereby aren’t able to take the messages and ideas seriously. It might help to discuss the fact that in Japan the manga comic book format is often used to explore serious and adult themes or subjects. The book succeeds in being an enjoyable but thoughtful exploration of what it means to have a career. I can imagine students questioning the wisdom of some of the advice, but that might actually make Bunko stronger and more effective — it can serve as a springboard to discussion and writing in a way that a more traditional career book might not. I loved this book and am glad to see you review it. I actually found the advice to match up with many of my own beliefs. I think the book could be used in ELA settings, business classes, and maybe best used in civics or philosophy units. The "WTF! 's" got to me a bit, but I can easily overlook such things.